There are many ways to decorate your home for the holidays. If you like to display seasonal wreaths on your front door, there are many different creative do-it-yourself wreaths that you can make any time of the year. 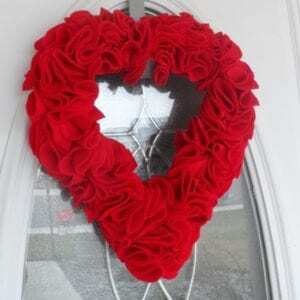 Here is an easy Valentine’s Day wreath you can make from felt with just a few supplies from your local craft store. This pretty wreath you can customize by making it any color you want. The one in the example is red, but you could make the wreath pink, white, or use any combination of the three. Make more than one and place them on more than one door in your home. You should be able to find the styrofoam wreath and red felt at any craft store. If not, you can buy both on Amazon for very reasonable prices. This wreath is very easy to make but it does take a little time, generally two to three hours. It works well to cut out the felt in one sitting and then pin it on the wreath in another sitting. You will need to cut approximately 75 3-inch circles out of the felt. Find a drinking glass that has a diameter of 3 inches and use it as a pattern to trace onto the felt. If you can’t find felt on the bolt (it is cheaper this way), you can also use squares of felt that you can find at most craft stores. You will need approximately 16 squares of felt to complete this project. You can actually have a yard of red felt shipped to you by Amazon. After you have cut out the circles, pick up one of the circles and fold it in half. Fold it in half again. Place a fabric pin near the bottom of the piece, through all layers of felt. Attach the piece of felt to the styrofoam wreath. Continue pinning the circles of felt to the wreath until the wreath is covered. This part of the project goes pretty fast. Fill in any gaps with additional felt circles. This Valentine’s Day wreath is very easy to make, you can make it during a weekend afternoon or while you watch television in the evening. My women’s group at our church made these in an afternoon and they loved the wreaths they made. Don’t limit your festive wreaths to the Christmas season, you can use great wreaths to accent your decor any time of year.